Determined to shed a light on positive stories in Northwest Jacksonville, Albert Chester, Jr. is making a difference in the community he grew up loving. Last weekend the millennial opened The Capstone Institute, a Pharmacy Technician school located on Moncrief Road. “We are determined to help the determined succeed,” says Chester. The new school offers an alternative to an area where many face limited opportunity. 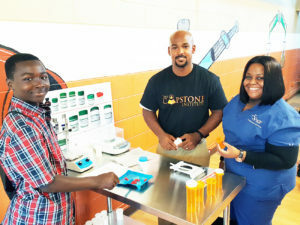 The school is licensed by the Florida Department of Education and Florida Board of Pharmacy and will train students to be a registered and nationally certified pharmacy technician within four months. Pharmacy technicians’ average annual salary is $29,810. Healthcare is projected to be the fastest growing industry over the next decade. The community attended the Capstone Institute open house over the weekend to learn more about the program. Attendees enjoyed free food, drinks, giveaways and prizes. Chester was a football standout as quarterback of Episcopal High School, when he graduated in 2003. 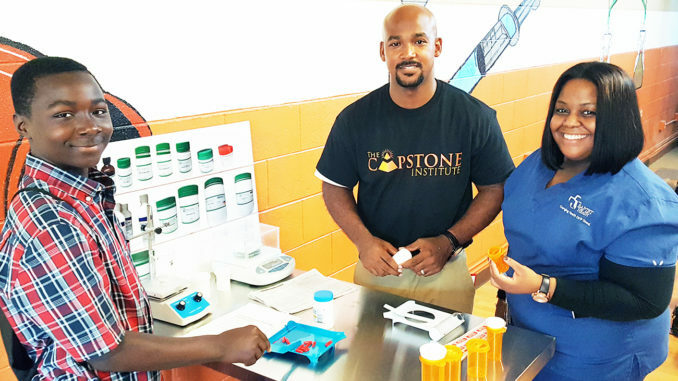 He went on to play football at Florida A&M University before earning a doctorate in Pharmacy and returning to Jacksonville to work as a Pharmacist for the past several years. The school is open for enrollees accepting 30 students. Tuition averages $2600 for certification.